A new year and promises of a new you! Now is the time to ensure that when it comes to work your business is going to thrive! What better way to help you do this than with a new website?! Many people still question why they need a website at all? Well, the power of the Internet continues to be growing at a rapid rate. Investing in a quality website can be one of the most impressive decisions you will have made to power your business through 2017! 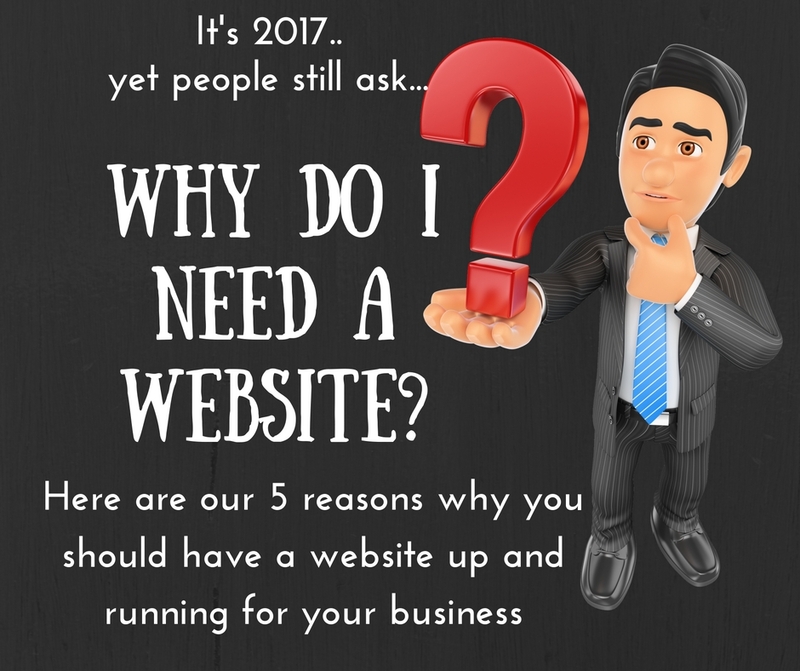 Here are our top 5 reasons why you should have a website up and running in 2017 for your business. 1.Your Top Competitor has a Website. If you are in direct competition with another business that has a website, they have the clear advantage - especially if they are also using the wide array of digital marketing strategies connected with running a website. To stay competitive with your opposition you need to have a strong web presence, it's that simple. More than ever before, people are going online to find the answers they are looking for. The old yellow pages' book is a thing of the past! Looking online for information especially from mobile devices occurs at the touch of a button. Your business needs to be at their fingertips online when looking through search engines. Without a doubt a website presence will gain credibility for your potential customers. If you already have a website but it is "out-dated", "home-made", or "not mobile responsive" - having it professionally redesigned will provide your business with a professional image which will inspire even greater confidence. This is particularly important for businesses that do not have a "physical shop front presence" as they do not have a store to promote their products or services. Customers are unable to walk in and assess face to face. A website is a window to the world. A good website is a quick and easy way to update information about your products or services. All information can easily be updated and events, specials and new arrivals can all be listed at the click of a button. Customer service is improved with "instant chats" or "messages" from potential customers and clients. A website is accessible 24 hours a day, 7 days a week, 365 days a year. It continues to work when you do not. With today's busy lifestyles, this is a great selling point when making a purchase decision. A website is convenient for customers who are themselves too busy during normal business hours. It allows your business to be more accessible for them, and that's always a good thing! 5. A website saves you time and money! Many often baulk at the upfront cost of a website but when you consider all that it does and break that down over a monthly or weekly period - you can't afford NOT TO DO IT! Compared to the costs of other mainstream marketing/advertisements a website is a cost-effective way to promote your business. Providing information to your customers takes time. By having the information all in one place a website can save you time to spend elsewhere. Such pages as a FAQ page, Services or Product Page help inform potential customers even when you are not at your desk, and can allow you more time to focus on other aspects of the business. It is essential to position yourself online with a strong, professional web presence that gives customers the impression that you mean business and the motivation to want to engage in your business further. A professional, polished looking site that has easy navigation, functions easily, with great imagery and professional quality content is no longer a luxury business requirement - but a necessity for success! Majority of people these days do their research of products and services online, and that's where you need to be. There are a multitude of options when it comes to creating a website for your business. From a basic web package to investing in a quality, custom - made website so you stand apart from the competition Central Coast Web Design are here to assist. If you are ready to get started on your website call Central Coast Web Design on 43413313 or email us at enquiries@centralcoastwebdesign.com.au . We'd be happy to help make your web presence stand out online.